CCS Haryana Agricultural University Result: Chaudhari Charan Singh Haryana Agriculture University (CCSHAU) is an agriculture university funded by the state government. It is one of the biggest agricultural universities in Asia. It was established in 1970 by Haryana and Punjab Agricultural Universities Act, ratified 2 February 1970. It was then named as Haryana Agriculture University. Initially, it was a satellite campus of Punjab Agricultural University at Hisar. CCSHAU is considered to be the first established university in the state of Haryana. A.L Fletcher was the first vice-chancellor of the university. The main campus of the university is situated at Hisar which covers an area of 6095 acres and the outstation campus a land of 1418 acres. The university has 6 constituent colleges and a Centre of Food Science & Technology. University offers various Undergraduate, postgraduate, Ph.D. programs and diploma courses related to agriculture. It has 8 Krishi Vigyan Kendras, 12 Krishi Gyan Kendra, regional centers and various other university departments situated at various locations of the state and are continuously serving the university and helping in research work. It is the university that publishes the maximum number of research papers among agricultural universities in India. It has also played a significant role in the Green Revolution and White Revolution in India. University has also won the Indian Council of Agricultural Research’s Award for the best institute in the year 1997. The Indian Council of Agricultural Research (ICAR) has ranked the university 4th best university among 57 agricultural universities. CCSHAU has also been ranked 76 overall and 50 among universities by NIRF for 2018. In this article, readers will get information about Chaudhari Charan Singh Haryana Agriculture University result. Along with the university result, the procedure to download the result, dates, readers will also get information about the entrance, admission procedure of the university. University provides admissions to the students on the basis of merit list in qualifying exam and various entrance exams conducted by the university and state/central authorities. Candidates interested in admissions into HAU have to fill an online registration fee first. University follows a credit system and semester pattern. The result for each and every course is prepared on the basis of both theory and practical exams. Exams for every course are conducted at the end of the semester. The mid-term exams for 1st and 2nd semester of all undergraduate courses are organized in the month of September/October and March respectively. Final exams of 1st and 2nd semester for all the UG courses are conducted in the month of November/December and May respectively. The mid-term exams for all postgraduate courses except MBA of the 1st and 2nd semester are organized in the month of September/October and March respectively. 1st and 2nd-semester exams of MBA programs are conducted in the month of October and March respectively whereas the final exams are conducted in the month of December and May/June for 1st and 2nd semester respectively. The result of the entrance test/aptitude test is declared within 10 days of the commencement of the exam. The result is announced on the official website of the university. The final result for all 1st and 2nd semester of all the UG programs is published online in January and June respectively. University declared the result of PG courses for both the 1st and 2nd semester in the month of January and June respectively. University publishes the result of all the entrance and university semester exams on its websites. No hard copy of the result is sent to the candidates through post. Students can check the result only through the online mode. The general information mentioned on the result include the name of the student, registration no/student ID/enrollment no, course, semester, year, subject-wise marks, total marks, grade points, result etc. After the declaration of result, students can collect their mark sheets and other certificates at end of the semester from the designated office or department of the university. Students should visit the university website on a regular basis so that they can get each and every update related to exam and university result. 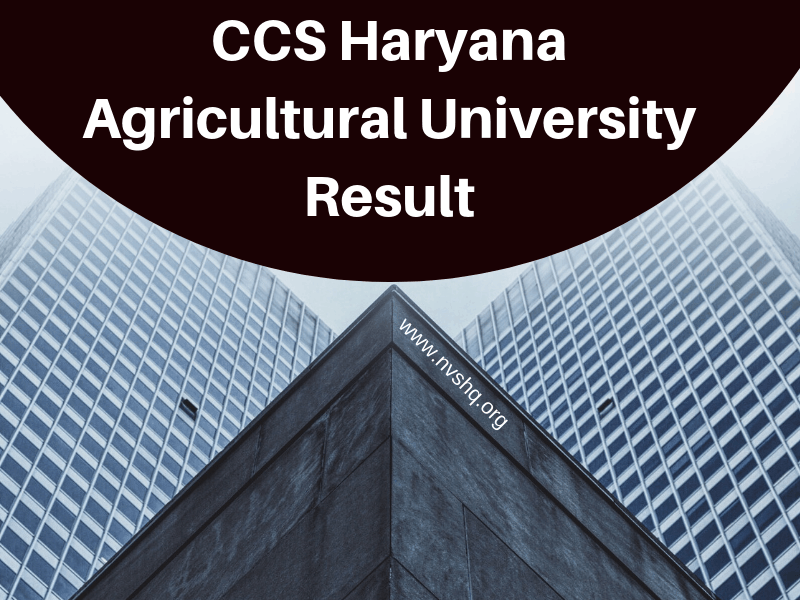 How to check CCS Haryana Agricultural University Result 2019? On the homepage, click on the “teaching” tab given at the top bar. Click on the relevant result option. Check the result and download it for future references. In case of any discrepancy contact the concerned university department. Keep visiting for more details about CCS Haryana Agricultural University Result 2019.